'Just listen,' Adam says with a voice that sounds like shrapnel. I open my eyes wide now. I sit up as much as I can. And I listen. 'Stay,' he says. Everybody has to make choices. Some might break you. For seventeen-year-old Mia, surrounded by a wonderful family, friends and a gorgeous boyfriend decisions might seem tough, but they're all about a future full of music and love, a future that's brimming with hope. But life can change in an instant. A cold February morning ...a snowy road ...and suddenly all of Mia's choices are gone. Except one. As alone as she'll ever be, Mia must make the most difficult choice of all. 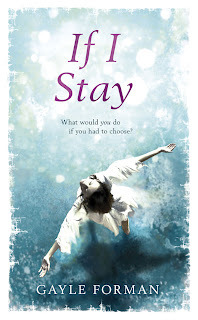 Gripping, heartrending and ultimately life-affirming, "If I Stay" will make you appreciate all that you have, all that you've lost - and all that might be. For an extra entry, follow this blog or subscribe to it's feed and leave another comment to let me know that you've done that. For a third entry, tweet or blog about this giveaway. This giveaway is open internationally! You have until the 14th of July! Sounds like a great giveaway! Count me in! I would like to be entered into the contest. My email addy is oasisvalley at gmail dot com. I am also a follower, but I use google reader. I think the most difficult decision I've made recently was to stop trying to have children. I really want kids right now, but its just not happening for us.. I've already subscribed to the feed. I'd love to win a book. I don't know what my most difficult choice was. Probably quitting my job to stay home with my kids. I'd love to win a copy of this one. My hardest decision ever has been not to put my life at risk by having more children. I haven't made any really hard decisions recently, but it did take me quite a long time to decide not to take my little boy to nursery this morning. There is a chance he has chicken pox, but I really wanted a morning to myself. In the end he stayed at home with me, but I still don't know if he has it and it may have been for nothing! I'm already subscribed to this feed! I haven't made any hard choices recently. Though at the end of this month I have to choose some very important courses, that might have a big impact to my studies. Please count me in! I'd love to read this book. I'm happy to say that I haven't had to make any hard choices for a long time. I've become a follower and would love to win this book. It sounds like a beautiful story. The hardest decision, to take my sons to see my Dad (their Grandfather) after he died at the funeral home. They were only 8 and 11 at the time but everyone else saw him the night he died unexpectedly so they needed closure. It was the hardest thing I ever did as I had never seen someone who'd died before. My Dad was only 61 so it was a shock to us all.